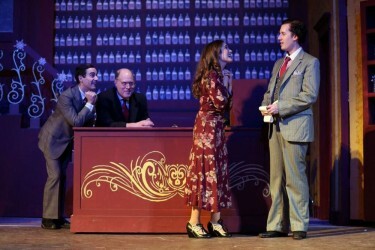 Everything about the production of She Loves Me by the Seattle Musical Theatre at Magnuson Park sings “fun.” Originally produces on Broadway by Harold Prince, Joe Masteroff penned the book, and Seldon Harnick and Jerry Bock provided the music (their next play was Fiddler on the Roof). Director Alan Wilkie has honed all of the considerable talents of the cast and crew to a sharp edge. Show Business is not a Disease….That is the Question. Is the essence of the “plot” of this Vaudeville/Musical, The Grimaldi’s A Musical Ghost Story, by Dane Ballard, which opened Friday night.